Home/Corporates, General, Startup Europe Partnership, Startups/The Italian Scaleup Ecosystem in the Making. Conducive to bringing forth an innovation plan for the Italian startup ecosystem, Mind the Bridge and Startup Europe Partnership (SEP) – in partnership with AGI (a prominent Italian economic and industry news agency) – presented the 2017 SEP Monitor “Scaleup Italy”. The launch event has been organized at the historic Tempio di Adriano in Rome, exactly 6 years after the appointment of the ministerial task force that marked the birth of legislation to support startups. For the presentation Italian leaders met to ask all political forces for a national plan to implement and foster innovation. The SEP Monitor shows all relevant factors and data of the Italian landscape by focusing on scaleups, the more mature outcomes of a startup ecosystem. In a nutshell, from the research emerges that Italy is a late mover in the startup game, where it takes time to produce results (i.e. scaleups) and one of the reasons is that investments in the Italian startup economy are simply not enough. As a matter of fact, Italy’s performance is among the lowest in Europe, more than 4 times lower than the European average. Being the overall capital invested in Italian scaleups equal to approx. 0.05% of Italy’s GDP, the untapped potential resides in the fact that Italy ranks 8th in the world for GDP, suggesting that there’s a strong economic base to pull from. 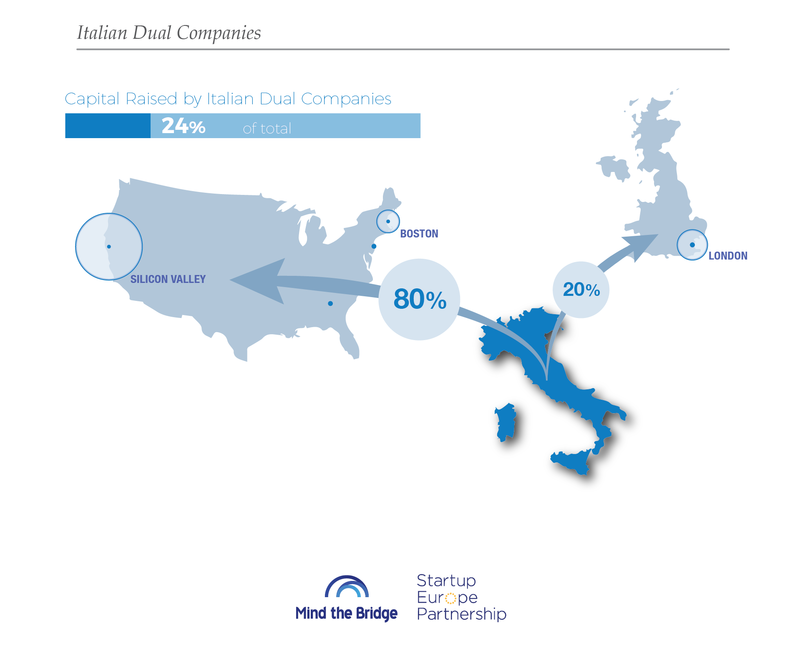 In the absence of a solid domestic investment scheme, the “dual companies” model for Italy seems to work. 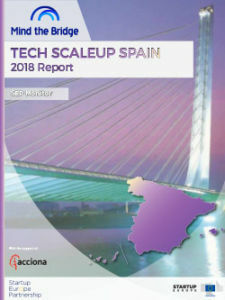 Italian scaleups go abroad for funding by moving the headquarters and operations abroad (mainly US and UK in Europe), while maintaining the research and development in Italy. The Italian scaleup landscape is populated by companies operating in different sectors, without any specific “house specialty”. The largest sectors in terms of volume are E-commerce (19% of total), Fintech (10%) and Digital Media (9%). 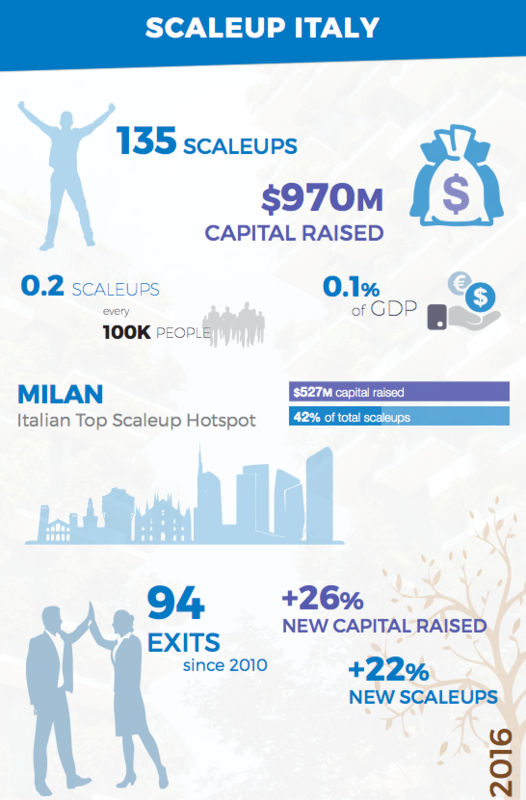 almost 20% of total capital raised by Italian scaleups. But Yoox is definitely an outlier for the Italian ecosystem, not only in terms of size, but also in terms of age as Italian scaleups are among the smallest and youngest in Europe being 76% of them founded after 2010. The research contributed to inform a to-do-list to foster the Italian startup ecosystem for the political agenda of the Italian government to be elected in March. Rome wasn’t built in a day, neither were Italian scaleups.